Vitamin A deficiency | Infonet Biovision Home. Vitamin A deficiency is a surprisingly major health problem worldwide. It is most prevalent in children and expectant women. It is the world leading cause of preventable blindness in children. It compromises immunity and increases the risk of disease and death from severe infections. It is a significant contributor to maternal and child mortality. In the eye to allow for night-vision or for seeing in dim-light circumstances. In the body for regulating the development of various tissues, such as the cells of the skin, and the lining of the lungs and intestines. Vitamin A is important during embryological development, since without the fertilized egg cannot develop into a foetus. Overall, it is crucial for a healthy immune system. Primary Vitamin A deficiency is usually caused by prolonged dietary deprivation. people with diseases that affect the intestine's ability to absorb fat. Examples of such diseases are chronic diarrhoea, celiac disease (chronic nutritional disorder), cystic fibrosis, and cholestasis (bile-flow failure or interference). It may also occur after intestinal surgery. Vitamin A deficiency is common in prolonged protein-energy malnutrition not only because the diet is deficient but also because Vitamin A storage and transport is defective. Normally, the liver stores 80 to 90% of the body's Vitamin A so anything that destroys it (like alcohol abuse) can lead to Vitamin A deficiency. Night blindness: This is the earliest symptom of Vitamin A deficiency. It is the result of difficulty for the eyes to adjust to dim light. Affected individuals are unable to distinguish images in low levels of illumination. People with night blindness have poor vision in dim light or/darkness, but see normally when adequate light is present. Vitamin A is needed for the production of rhodopsin, the eye pigment responsible for sensing low light situations. Without this pigment, the eye cannot see well in dim light. Xeropthalmia: This is a condition where eyes fail to produce tears. Prolonged deficiency results in drying of the conjunctiva (the mucous membrane that lines the inner surface of the eyelids and extends over the forepart of the eyeball). With continued Vitamin A deficiency, the drying extends to the cornea. The cornea eventually shrivels up and becomes ulcerated (keratomalacia). Superficial, foamy gray triangular spots may appear in the white of the eye (Bitot's spots). Finally, inflammation and infection occur in the interior of the eye, resulting in total and irreversible blindness. Changes in the skin and the mucous membranes in the respiratory, GI, and urinary tracts can occur. Drying, scaling, and follicular thickening of the skin and respiratory infections can result. Immunity is generally impaired. This results in respiratory, urinary and other infections. The younger the patient, the more severe are the effects of Vitamin A deficiency. Growth retardation and infections are common among children. Mortality rate can exceed 50% in children with severe Vitamin A deficiency. If you have any of these eye symptoms, go to your doctor who will check your retinol (Vitamin A) levels and institute the necessary management. 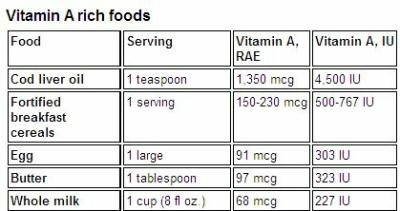 Eat diet rich in Vitamin A. Liver is the richest animal source. In plants it is in the form of carotenoids like beta-carotene, best found in yellow and dark green crops. (see table). Food fortification: can be done with wheat, milk or even sugar but this is a costly process. Margarine and oil are the ideal food vehicles for Vitamin A fortification. Supplements: this is the approach taken by most developing countries. Some have incorporated Vitamin A supplementation to their immunization schedule. Giving the supplements up to five years of life. It is usually given in oral form. It is affordable and readily acceptable amongst most communities. Remember a Vitamin A deficiency in lactating mothers will produce breast milk with low levels of Vitamin A. Maternal supplementation benefits both mother and breast-fed infant: high dose Vitamin A supplementation of the breast-feeding mother in the first month after delivery can provide the breast-fed infant with an appropriate amount of Vitamin A through breast milk. However, high-dose supplementation of pregnant women should be avoided because it can cause miscarriage and birth defects. The treatment for Vitamin A Deficiency related problems involves giving high dose Vitamin A (usually available as retinyl palmitate) either orally or through injection. In children with complicated measles, Vitamin A can shorten the duration of the disorder and reduce the severity of symptoms and risk of death. The prognosis for correcting night blindness is excellent. Xerophthalamia can be corrected with Vitamin A therapy. Ulcerations, tissue death, and total blindness, caused by severe Vitamin A deficiency, cannot be treated with Vitamin A.
Balch Phylis A. and and Balch James F.; Prescription fro Nutritional healing, 3rd Edition. Lee V, Ahmed F, Wada S, et al. (2008): Extent of vitamin A deficiency among rural pregnant women in Bangladesh. PUBLIC HEALTH NUTR. Jun 12 2008;1-6. D'Souza RM, D'Souza R (2002):. Vitamin A for treating measles in children. COCHRANE DATABASE SYST REV;(1):CD001479.